By using these online Photoshop alternatives you can easily access more than what you have ever-thought. These online editor allows you to fully control your images and show your skills. Here you will get new tools through which you can retouch your photographs and much more. Below we have listed the best 5 web-based Photoshop alternatives with their descriptions and web link so you can get them easily. This is a fast and free online photo editor. By using it, you can easily and quickly edit all your existing photos and even create photos from scratch. It supports different image formats like JPG, PNG, MNP, TIEF and PXD. And all these formats are layered by Pixlr itself. Interface of Pixlr comes with multiple-languages support and mobile version is also available. These are the best 4 Android web browsers that lets you access to pixlr.com with great experience. You can use Pixlr for Web graphics. When you create new photos you can adjust image size according to your need, but you can’t set the resolution. There are also some other limitations with size and format. Basically Pixlr is not made for Photoshop replacement, so you can use this for creating banners or a web images but not for print due to resolution issue. 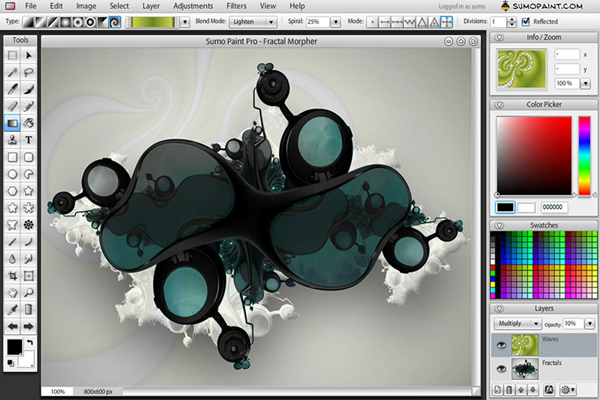 We can say that Sumopaint is the real competitor to famous Photoshop desktop application. Sumopaint comes with clean and clear interface which is a bit similar to Photoshop, so you can work fluently with it. It allows you to edit your existing image and also you can create new image. The free version of Sumopaint only supports native SUMO format, PNG and JPG. Another difference between the free and paid versions is the free version contains ads. Here we are talking about free web-based Photoshop alternatives so we will only compare the free version. You can also go to the pro or pro plus versions, which will cost only $9 and $19 respectively. This is a great browser for web graphics. We can say that it is a fine replacement for GIMP/Photoshop. It is a free online graphic tool offers by Adobe. 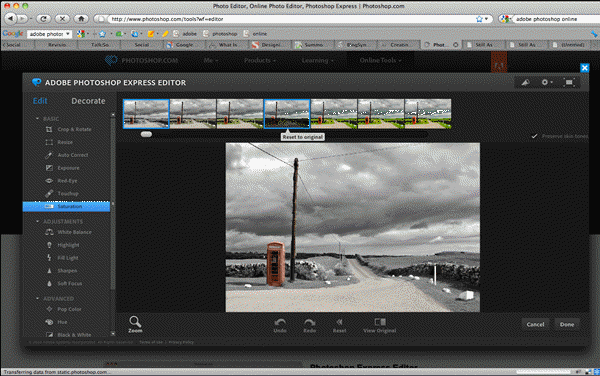 Photoshop Express is a combination of Adobe family and it is loved by many users. If we compare it with Pixlr and Sumopaint, its performance is a bit weak. Here you only get JPEG format support and you cannot create photos from scratch. Photoshop Express comes with fraction of functionalities. As Photoshop Express don’t have much features, you don’t need to take much time to understand the whole application. Mostly functions are at the left frame, where the toolbox is located. Here you find 2 tabs for Edit and Decorate. In Edit you will find options like Crop, Resize, Red-Eye, basic-adjustments (like White Balance, Sharpen, etc.) and more effects like Crystalize, Pixelate, etc. 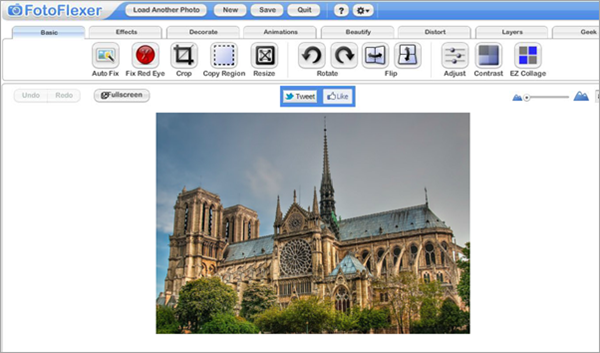 Lunapic is a very easy and simple online photo editor, and you will never get confuse while using it. It has small toolbox, which contains Cut, Copy, Paste, and Print tools. There is a big difference between the menu of Lunapic and that of Photoshop. That is, Lunapic provides more functions than the base version Photoshop. It gives you the unique features to encrypt/decrypt images, save photos to your computer, and share them to Imgur, email, Tumblr, Picasa, Facebook, Web, and etc. FotoFlexer claims to be the number one advanced online image editor in the world. This free web Photoshop alternative app which serves different features. For Photoshop users the interface of FotorFlexer is confusing. It do not follow the standard menu convention like Smooth and Sharpen. It contains ads which makes it a bit slower. However, it is good for basic photo editing. You can find some really good features in Fotoflexer, but here in our list it ranks at the bottom. Pixlr, Sumopaint and Lunapic these three web-based Photoshop alternatives are the best ones in our list. These three are rich in features and can easily compete with Photoshop on many graphic projects. 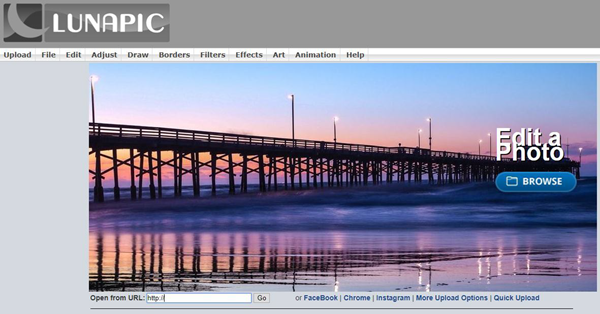 We have listed the best 5 online photo editor above with their description and browser link. 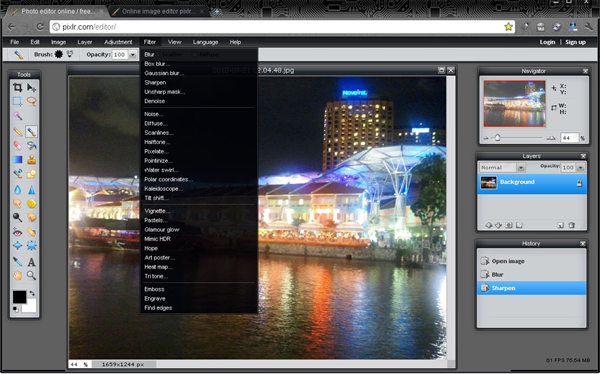 Each tool have clean and clear interface so, you can edit your photos quickly and without getting disturbed. You can choose anyone according to your need. Besides, you can also use these Photoshop Alternatives for Windows Computer. Which is your favourite online Photoshop alternative? Comment down your choice in the comment section below.